Magnetic Resonance Imaging (MRI) is a versatile tool for diagnosis, but it has a limited functionality in assisting recovery of brain after an intervention or injury. A number of rehabilitative procedures have been developed for brain recovery; but due to the intense magnetic field in MRI rooms and the spatial limitations, MRI’s capability in monitoring cannot be utilized. MRI compatible robots that are tele-operated from MRI Control Room can enable an operator apply repetitive exercises on the subjects and observe the neurobiological changes in the brain simultaneously. In this project a fluid driven, MRI compatible haptic interface is developed and methods to control its impedance are investigated. The interface is planned to be used in investigating fine motor skills of hemiplegia patients. Due to the intense magnetic field inside MRI rooms, pneumatic actuators need to be driven via long transmission lines. Long connection tubes affect the pressure dynamics of the system, introducing significant time-delay and mass flow attenuation. Traditional pressure estimation and non-linear control methods present poor accuracy in the existence of such connection tubes. 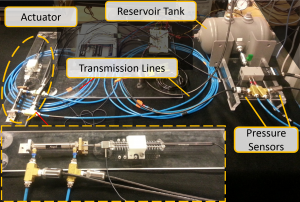 This project is aimed to develop non-linear pressure observation and control algorithms that would mitigate the adverse effects of the transmission lines and enable moderate frequency force/impedance control. Force feedback is a crucial element for medical robots as it provides surgical robot operators with a sense of touch  or physicians with quantitative feedback on the patient during a rehabilitation therapy. In addition to being MRI-compatible, such force sensors have to be compact due to the tight space in the MRI bores. Typically, plastic deformables are preferred for their ultimate MRI compatibility. A compact displacement amplifying mechanism (DACM) was designed for a 1-axis force sensing unit. The sensing principle of the proposed design was chosen to minimize the cable traffic and input handle. The sensor topology was analyzed via analytical methods for an optimal hysteresis performance. 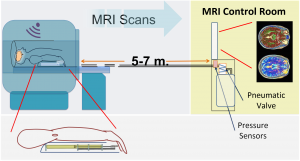 Turkseven, M.; Ueda, J., “Analysis of an MRI Compatible Force Sensor for Sensitivity and Precision,” Sensors Journal, IEEE , vol.13, no.2, pp.476,486, Feb. 2013. Turkseven, M.; Ueda, “Observer Based Impedance Control of a Pneumatic System with Long Transmission Lines,” IEEE International Conference on Robotics and Automation (ICRA), 2016. 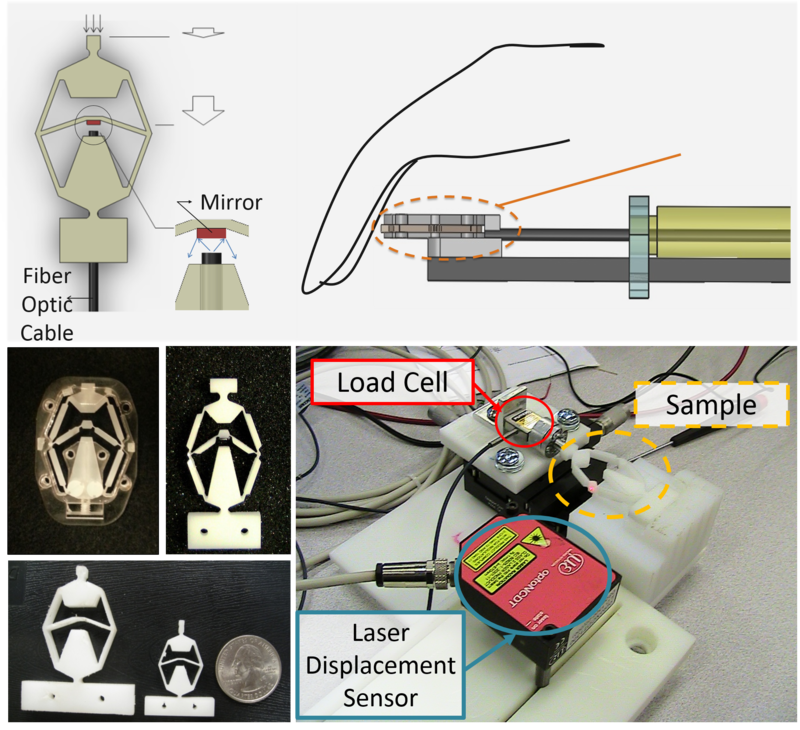 Turkseven, M.; Ueda, J.; Kovalenko, I.; Kim, Eui Sun., “Design and Dimensional Analysis of a Tele-Operated MRI-Compatible Vane Actuator for Neuromuscular Fascilitation in Hemiparetic Limbs,” Dynamic Systems and Control Conference (DSCC), 28-30 Oct. 2015. Turkseven, M.; Ueda, J., “Design of an MRI compatible Haptic Interface,” Intelligent Robots and Systems (IROS), 2011 IEEE/RSJ International Conference on , vol., no., pp.2139,2144, 25-30 Sept. 2011. J. Ueda, D. B. Comber, J. Slightam, M. Turkseven, V. Gervasi, R. J. Webster III, & E. J. Barth, “MRI-Compatible Fluid-Powered Medical Devices,” Dynamic Systems and Control Magazine, 1(2), 13-16, 2013. Lacey L, Buharin V, Turkseven M, Shinohara M, Ueda J., “Control of Voluntary and Involuntary Nerve Impulses for Hemiparesis Rehabilitation and MRI study,” 6th Annual Dynamic Systems and Control Conference, 2013. Ueda, J., Lacey, L., Turkseven, M., Shinohara, M., Maliki, A., & Kovalenko, I., “Robotic Rehabilitation Exercise in Hemiparetic Limbs Based On Functional Synchronization of Voluntary and Involuntary Nerve Impulses,” In Advanced Robotics and its Social Impacts (ARSO), 2014 IEEE Workshop on (pp. 114-120). Ueda, J., Lacey, L., Turkseven, M., Shinohara, M., Kovalenko, I., Kim, E. & Sulejmani, F., “Robotic Neuromuscular Facilitation for Regaining Neural Activation in Hemiparetic Limbs,” Proceedings of ASME 2015 International Design and Engineering Technical Conferences \& Computers and Information in Engineering Conference IDETC/CIE 2015, August 2-5, 2015, Boston, Massachusetts, USA.